If you can’t do the time, don’t do the crime. Optimus Crime to be exact. 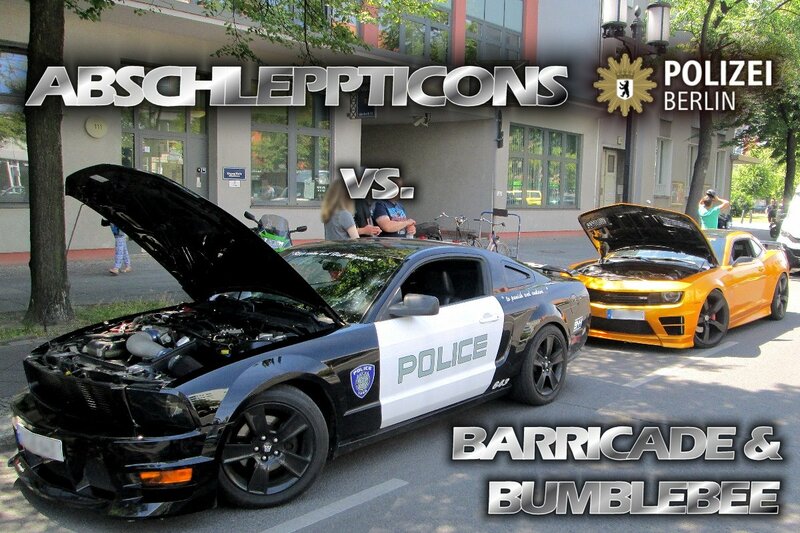 Two vehicles standing in as Bumblebee and Barricade for an undisclosed promotion for the movie has been arrested by the Berlin Police. So #Bumblebee and #Barricade reckoned without our tougk-as-steel colleagues when they were cruising through Charlottenburg yesterday. Both stumbled into a traffic check of our sections 24 and 25 on Bismarkstraße in Charlottenburg around 12 o’clock. “Since there is most likely no such a thing as road traffic regulations on planet #Cybertron, both were in for massive trouble. Aside from the chassis, the tires and the lighting, both cars’ exhaust systems clearly appeared to have massive flaws. On top of that, #Barricade sported an “injury” on his rear axle. He wouldn’t tell us what had caused the dangerous loss of oil. However, there was no suspicion of an “Optimus Crime”. Thanks to the assistance of our Haulicons, we brought both of them to planet “Dekra“. There they joined their other steel pals and waited for an expert opinion from planet Earth. The inspection institution may not Cybertron, but at least they’re the only ones of their kind there. – Participation in next week’s film premiere may be jeopardized. This news and the translation comes courtesy of 2005 Boards Member Nevermore. "HI! i'm bumblebee, and this is barricade…he was a prison b-"
……can this be a thing?! LOL. Kind of not nice of the police to do this, though, given how these type of cars are only used for promotion. Heck, actually we in Hungary have "Barricades" you can drive around, that is, his older TF1-3 look, repainted as US police cars. You can rent and drive them legally. Did you actually read the police report I translated, or did you just immediately type your response after reading the headline? Nowhere in the police report do they make a reference to Barricade's deco. That's not what caused a problem. At all. They were being driven around on a public street. Not being unloaded for being put on display. Driving on the street. The police checked them and found several problems that were in violation of German traffic safety regulations. Considering that movie promotions happen all the time, I don't think that promotional vehicles driving on a public street should get a free pass because accidents don't care whether it's done for a movie promotion or not. That's like how at my workplace, some people think it's okay to ignore safety regulations whenever items need to be processed quickly so they get shipped to the customer on time. Accidents don't care whether your work needs to get done "quickly" for whatever reason. In fact, accidents often tend to happen when the pressure to finish certain tasks is at its peak. Nah, Longarm is better to keep the costs down. Plus that mold still stands well today. "Crashing the box office…WITH NO SURVIVORS!"